Evoking the early Spanish conquistadors, explorers, and missionaries who came to Texas and other southern states centuries ago, the historic named highway known as the Old Spanish Trail (OST) includes segments of some of the oldest roads and trails in Texas. Spanning the nation from St. Augustine, Florida to San Diego, California, the OST took a more southerly route than the Bankhead Highway and was touted as the shortest transcontinental highway in the United States, especially when compare to the Lincoln Highway, which extends from coast to coast across the nation's mid-section. The OST enters Texas at Beaumont, passing through Houston and San Antonio before leaving Texas via El Paso, with various alignments. Impetus for the creation of the highway stems from the efforts of a group of individuals, primarily from Florida and Alabama, who met in Mobile, Alabama, in 1915 to create the Old Spanish Trail Association. It was one of many such auto trails groups established around the county as part of the Good Roads movement that promoted improvements to and expansion of the nation's highways. 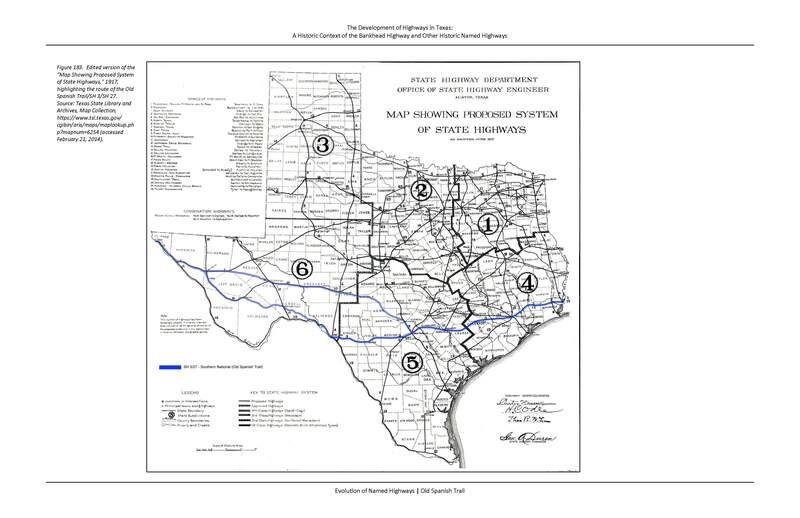 The route quickly assumed a leading role in Texas' emerging highway system, in part, because it traveled to not only some of the state's most important nodes of military installations and industrial centers, but also some of the state's best known tourist destinations, parks, and recreational centers. The historic highway has largely been subsumed into IH 10, which often follows historic alignments associated with the road. Segments of the historic roadway still exist on segments of varying lengths that parallel the interstate highway. Nonetheless, of all the named highways in Texas, the OST arguably has retained its historic identity to a highest degree because of its direct link to the state's rich history. The sense of pride that Texans have enjoyed and appreciated through the state's history contributed to the enduring quality of the name Old Spanish Trail, and the term is still used in Houston and other cities along its route. The Old Spanish Trail (OST) segment immediately east of the Colorado River near Columbus is a 1.4-mile-long section of a state highway built in 1920-21. The listed road runs between business routes US 90 at the western terminus, and the north access road to Interstate 10, which later served as the main line of US 90 before the construction of the interstate highway. The 1922 East Navidad River Bridge is a 199-foot-long concrete cantilever bridge on FM 1579 east of Schulenburg, Texas. It consists of two-curved cantilever arms supported on skewed concrete piers and abutments, with a 70-foot-long center arch span. Simple concrete slab and girder spans serve as approaches at each end of the bridge. The open-style railings are of a modified “Type C” design, with concrete posts and two-beam rail divided by battered concrete pedestals. The bridge has a total width of 21 feet and 2 inches, with an 18-foot roadway. Designed by Texas Highway Department engineer A.T. Granger, this graceful crossing retains a good degree of integrity. The Flatonia Historic District is a roughly 36-acre commercial and industrial district located in Flatonia, Texas, a town in southwestern Fayette County between San Antonio and Houston. Flatonia was incorporated in 1875 along the Galveston, Harrisburg and San Antonio Railroad (now Union Pacific Railroad), and the railroad tracks bisect the historic district, separating it into roughly two halves with adjacent properties being oriented toward the railway. The majority of the resources are one- and two-part commercial block buildings constructed of locally sourced stone or brick with façades representative of the time. These buildings, which were mostly erected during the late 19th century and early 20th century, illustrate Flatonia’s primary periods of development and reflect the commercial architecture trends of the area. Some of the district’s storefronts were modernized during the period of significance, illustrating the way in which commercial enterprises adapted to changes in consumerism over time. On the perimeter of the district are a number of late 19th century and early 20th century industrial buildings which are strictly utilitarian in design. In total, there are 74 resources (69 buildings, 1 site, and 4 structures), of which 60 are contributing and 14 are noncontributing.